We did the unthinkable: bypassed the TN Aquarium in favor of the Creative Discovery Museum. For one, it was much cheaper-$8 vs. $18/$23-with-IMAX. With the Spring Break crowds, we weren't sure the kids would get a great view of the fish. 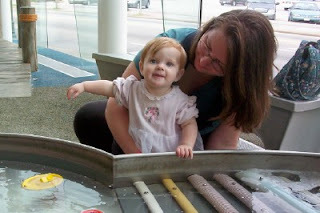 The children's museum was perfect for preschoolers--and even the baby had fun! The glass wall that looks out onto Chattanooga's beautiful downtown. The front half is a giant waterworks--simple machines, locks, shooters, waterfalls. Wow! Then we went to the Inventor's Workshop. 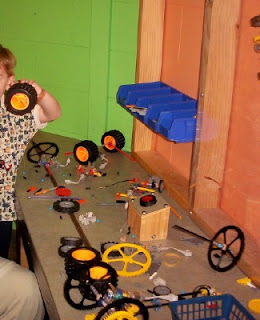 Benches full of Knex parts let you build your own motorized vehicle to run on the tracks. Don't know who enjoyed this more! On to the Excavation Station! 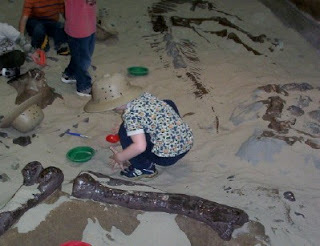 In addition to geology exhibits, a giant sandbox with "dinosaur bones." 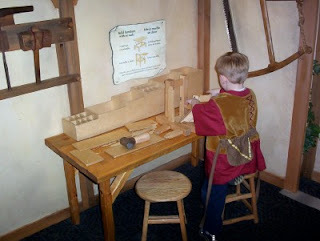 Discovery Museum, you had me with "giant sandbox... "
...to individual stalls with blacksmith, tailor, and carpenter. The kid begged to go back. Next trip, we'll start early in the morning and plan to stay about three hours--or more. My research group actually held their retreat at the museum one year (they scheduled it for prom weekend in Chattanooga and there was literally no other spaces available in the city). 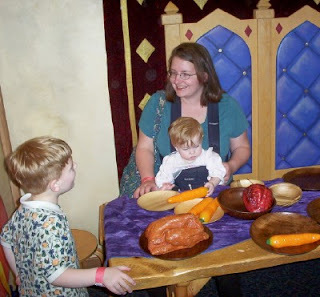 It was a fun place to be, and it was nice to the chatter of children during our sessions! Times really do make a difference. We went to Chattanooga in the fall a few years ago right before school started back. The Children's Museum was totally crowded but the aquarium was not as bad. We got our tickets cheaper through reciprocation with our zoo membership. It worked out to about 11 dollars a person in our group. I had been wanting to go to the TN aquarium since before I got married, but it looks like the Children's Museum will be great when we head that way again! Looks like your having a great time. Thanks for sharing. Wow - I didn't realize the aquarium was so crazy expensive now!!! The museum looks great - I can't wait to visit with my kiddos! It's cheaper if you don't do the IMAX and of course the kid's tickets are cheaper--only $9. But for two parents and a child, it works out to almost $50. 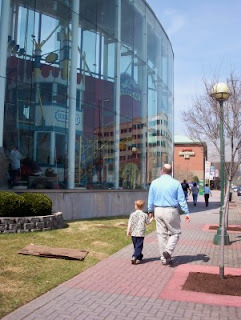 The Creative Discovery Museum has coupons online, so we spent less than $25 total. We pass through Chattanooga at least twice a year, so we'll do the Aquarium eventually. I just want to make sure we get our money's worth when we do! Looks like the children's museum was a great place!!! I had heard good things about it, but to see pics and all of the fun activities they have, I'll have to take my little girl next time we visit grandparents in Cleveland. BTW, did you ever figure out anything to do there? Hubby said he didn't remember doing a lot in town. Rather, they would go to Chattanooga on field trips, etc. He did say you could tour the M&M/Mars factory...yum! Glad y'all are having fun!!! The children's museum sounds great - I didn't even realize it was there. 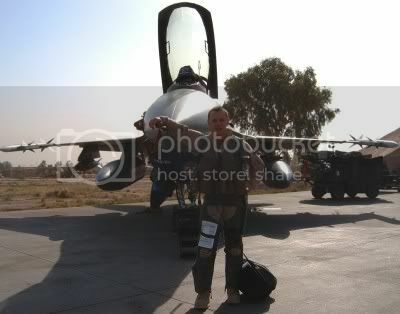 We'll definately be making a visit next time we're up that way! looks like a great trip! Hope you had a happy B-day as well. I hope you get my gifts in the mail soon! The giant sandbox is awesome! 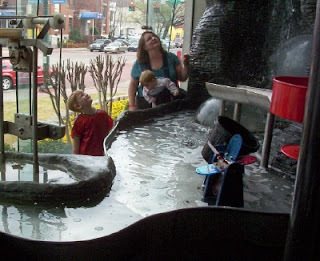 The science museum in Dallas when I visited my sister last year had something like that. We had to practically drag Princess and her Cousin out of it! Wow! That looks great, makes me want to travel there someday. For West Coasters, the Portland Children's Art Museum has a similar waterworks, plus a dig pit filled with shredded rubber and a clay studio--nice if you are visiting during a rainy time.